You all know that feeling. And before you walk out those department store doors, you’re already thinking of how you should return said item. Buyer’s remorse is a tricky beast — at least for me anyway. A lot of the time, even when I really LOVE something and manage to find it on super sale somewhere, I’ll still feel a pang of immediate regret. Like I should be spending that money on something else perhaps? Or storing it away in my savings. Or contributing it to my SEP IRA that I just opened for my retirement (yay, adulting hard over here). Of course, all three would be admirable, and don’t get me wrong, I manage to put away a bit each month for all of the above. But I’d by amiss if I didn’t admit to enjoying the occasional milestone celebration marker — an investment treat to myself (big or small!) that I, and I alone, worked hard for. The catch is: I wish I could say there was a way to avoid buyer’s remorse — I’m afraid it’s just taken me a fair bit of trial and error to really see what I get the most joy and use out of in my closet vs. what I just plain don’t. This coming weekend marks my official foray into spring cleaning, starting first with my closet, hence the catalyst for this post. Over the years, I’ve accumulated a handful of designer items that I reach for time and time again and a handful that just miss the mark, horribly. It’s not that I don’t like those items, I just didn’t fully realize how they would fit into myself style when I purchased them and there they sit, on a shelf, begging to be worn! A lot of you guys often ask if certain purchases of mine are worth it (these Balenciaga knife mules being the most recent — the answer: YES!) — well I’m spilling the beans on what’s proven its worth and what hasn’t — with everything in the latter camp being listed either on Poshmark or The RealReal very soon! My Chanel 2.55: I think it’s safe to say, Chanel retains its value beautifully, making it an easy brand to add to the BEST list. Even if you tire of a certain Chanel item, there’s a fair bit of piece of mind knowing that it can be resold for an asking price not far off from retail (depending on the quality). This particular 2.55 bag was my first official Chanel piece, making it irreplaceable in my eyes. A few years ago, I had worked with a particular designer consignment shop who allowed me to select a Chanel of my choosing in exchange for a blog post and it’s been one of my favorite classic bags ever since. 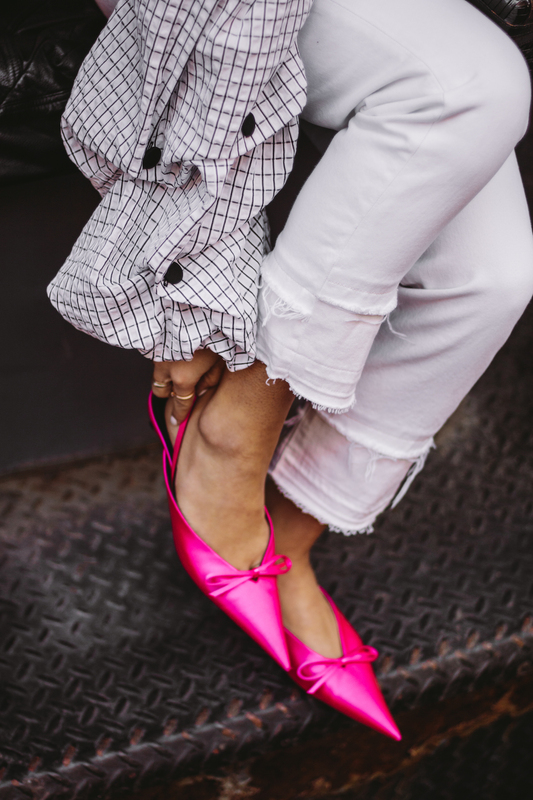 Manolo Blahnik Hangisi heels: I purchased these heels soon after a promotion at Google and while I remember the distinct pang of buyers remorse when I purchased them, they’ve been loved ever since. Admittedly, they’re not an everyday kind of heel — they’re satin and the pitch is really high — but I just love how they feel like distinct pieces of art, hence why they sit on a shelf in my apartment on display when I’m not wearing them. My Olympia Le-Tan clutches: You all know I have a soft spot for kitschy accessories — especially ones that look like my favorite book titles! Olympia Le-Tan has been a longtime obsession of mine ever since I snagged one of her clutches on MAJOR sale at a favorite consignment shop of mine in San Francisco. From that point on, it’s been a treasure hunt of sorts for me, looking for her clutches in sale sections online and in vintage stores. Plus, I love how well they store on my book shelves, blending in seamlessly with my other books. Chanel slingbacks: I scooped my captoe Chanel slingbacks on my birthday last year and have been incredibly happy with my cost per wear since. Let it suffice to say, whenever I’m in doubt, these slingbacks usually work with whatever outfit I’m planning and they’re low chunky heel makes them, hands down, one of the most comfortable pairs of heels I own. They’re effortless. They’re timeless. And I hope to have them for years to come. McQ leather jacket: Another cost per wear MVP — this leather jacket has been with me through thick and thin, since my San Francisco days. It works just perfectly with a casual, dressed down outfit, just as well as it does with a lot of my cocktail dresses that need a little edge. And, of course, the leather has only gotten better over the years. Best part? I got it on SUPER sale again at my favorite consignment shop in SF. WORST: Worst just sounds so harsh. Let’s say LOVED but not worn ENOUGH to justify the purchase. Givenchy shark tooth boots: Oy, these were the first to add to this list. And here’s why: I was obsessed with these boots when they first came out. And in fact, I still love them. I just didn’t realize how unflattering they would be on ME, personally. I bought them at full retail price after a recent promotion at work (I rarely purchase things at full retail) and did in fact, wear them quite a bit. However, every time I looked at photos of me wearing them, something just seemed off with the silhouette they created on me. Sure enough, they were eventually moved to the back of my closet, out of sight and out of mind, but I still feel quite guilty about these guys. Chloe studded boots: These guys really pain my heart. I wanted them to work! I really did! I absolutely loved how they looked on all the models off duty during Fashion Week that I was determined to find them on sale somewhere. Lo and behold, they magically appeared on The RealReal at an amazing price and I snagged them! The problem was, they didn’t really match my style. Every time I went to wear them, I found myself reverse engineering my outfit around the boots — until it felt really forced. Since then, I’ve realized ankle boots that hit me RIGHT at the ankle don’t really mesh well with my style — I either need my boots to hit a bit higher, mid calf or above — or I’d rather opt for something else that shows my ankle off. Celine trapeze: This was my first BIG designer IT bag purchase. And it was the last one I ever made for the sake of an IT bag purchase. Don’t get me wrong, I still love this trapeze bag — it just ended up being another item that I forced to work in outfits. It was too small for a work bag (I couldn’t fit my laptop in it) and it was too big for a day to day, running errands bag. Louboutins: This has become a hard and fast rule for me, ever since I bought a pair of black, classic Louboutins: they just don’t work on my feet. I have wider feet as it is, and Louboutins just run narrow. Like really narrow. Of course, when I bought this pair years ago, I was stubborn and decided to make it work — even if they didn’t fit all that well. That was the LAST time I knowingly went ahead with a shoe that just didn’t work with the size of my foot. As I mentioned, I’ll be listing quite a few of the above (and a ton more!) on my Poshmark account. I’ll share the link once everything is live! Style and designer purchases, new york, new york city, nyc, outfit, shopping tips, spring outfits. Luckily, all of the designer purchases I’ve made have been good ones! I love purchasing a little something when I hit a career milestone. I bought my Celine belt bag after getting one of my largest blog paychecks ever. I’ll always remember that feeling — so I know it was a good purchase! Also, I’m having the girls hunt down a pair of these earrings for me, you convinced me I need them in my life…SO gorgeous! So excited the Chanel slingbacks made the best list! They’re def on my list. This was a fun post to read because we’ve all been there! It’s amazing how one day you just have to have something and then one day it’s something you kinda wish you never purchased. And I’m loving your look on this post. That top is all sorts of gorgeous on you! Loved reading through this post and finding out about your hits and misses with designer pieces. Your top is insane, such a cool and unique piece! I hated those Givenchy boots on you- I wanted to scream- don’t wear! And I feel the same way about Louboutins- except I purchased about 5 pair – full price- before I finally yelled uncle! each time I wore- after professional “stretching”- it’s nice when you are finally comfortable in your style that you can say…NOT FOR ME!!! I was so obsessed with those Chanel sling backs when I first saw you wearing them. When I finally had a chance to try them on, though, they looked terrible on my foot / leg. My legs are too short or something… and they just cut me off. Interesting how some things just work and some things do not! So funny, because the Chloe studded boots would be my favourite purchase! haha I have worn them to death for the past few years. It goes to show you have to find the right boot cut for you. Aw! Thanks Shanna! It was called Jeremy’s and it was the BEST. But unfortunately, they closed a few years ago!! I’m not sure if there’s something similar in the city now, but I really hope there is! Disappointed that you did not show your “worst” picks and the only way we will see them is if we want to buy them …. you showed your wins … why not the ones that didn’t work out? Hi Kate! I actually did share the worst picks! If you click on the title of each item, for instance “Givenchy shark tooth boots” it hyperlinks to one of my original blog posts wearing them! I didn’t include any product links in this post intentionally because it didn’t feel like an appropriate shopping post to me. Let me know if those links don’t work for you though and I’ll try to fix the issue! Love your honesty here! It is so hard not to have buyer’s remorse when there’s so many adult things you have to do haha! Curious to know, what did you do with the ones that didn’t work out? Did you end up selling them? I liked reading this post, nice to see other ppl have regrets too! So I dislike those Givenchy boots so much, just generally speaking, I don’t think they look terrible on you in particular. I was glad to see them under worst purchases! Looking at your original post wearing the Chloe studded boots, do you think your legs are ‘too toned’ (ie. awesome and fit) so the height of the boot just cuts your leg off? I feel like I’ve only seen them look good on ppl with super skinny legs. Also, I can see how you felt you always had to reverse engineer your outfits around them, as you put it. Nice post, Krystal. Loving your content lately.